Quiet! Quiet on the set, everyone! Take your seats and prepare to be thrilled with songs and special appearances by some of Hollywood's biggest stars! 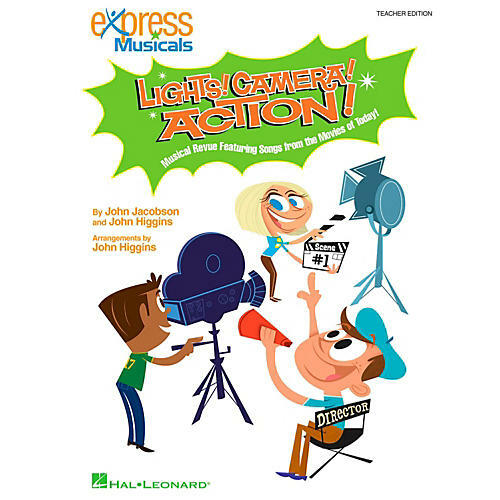 From the popular Express Musical series, this musical revue features favorite songs from the hit movies SpongeBob SquarePants, Finding Nemo, The Polar Express, Willy Wonka and the Chocolate Factory and Shrek. It includes short connecting dialogs for over 25 speakers and spectacular music for a show that will appeal to all ages. The Teacher Edition offers piano/vocal arrangements, choreography and script. Exciting full-color Singer Editions come in handy 20-paks, and a performance/accompaniment CD features spectacular orchestrations by John Higgins - all sold separately or combined in a value-packed Classroom Kit. Easy to produce, this 20-25 minute revue is suggested for students in grades 3-6 with a performance time of 20-25 minutes. Available: Teacher Edition, Singer Edition 20-Pak, Performance/Accompaniment CD, and Classroom Kit (Teacher Ed, Sgr Ed 20-Pak, and P/A CD). Musical Revue Featuring Songs from the Movies of Today!